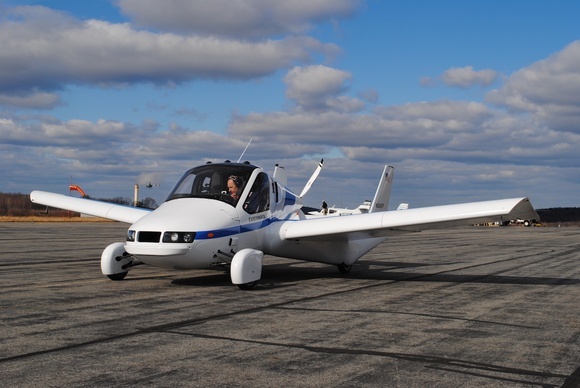 Boston-based flying car company Terrafugia has inked a deal for 6,700 square feet of hangar and office space at Boire Field Airport (KASH) in Nashua, New Hampshire. The lease agreement comes as the company revealed its plans to start production of its first flying car, the Transition, in 2019. Terrafugia, founded in 2006, has grown from 20 to more than 200 employees worldwide in the past year, thanks to a capital infusion by its new owner, Zhejiang Geely Holding Group of China. The company is proceeding with its testing program as part of the last phase to certify the Transition, a fully drivable and road-legal Light-Sport Aircraft. The first Transition flight assessment vehicle is expected to make its way to Nashua in early 2019. Terrafugia will test additional assessment, prototype, and production vehicles at Nashua airport and could see up to eight vehicles housed in the hangar at one time. The wing-folding mechanism allows for more aircraft to fit in the hangar space, company officials note. There will be six to 10 employees based at the office space, including flight test engineers, test pilots and marketing personnel. The facility may be used for flight training down the line, company officials add.